(Pittsboro, NC) – The American Livestock Breeds Conservancy (ALBC) announced today that L. Eric Hallman, PhD, has been named by the Board of Directors as the new Executive Director of the organization. 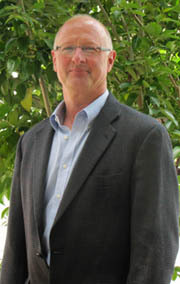 The ALBC Board of Directors selected Hallman, following a comprehensive national search, due to his unique combination of experience as a senior executive, scientist, educator, and civic leader. As the organization seeks to expand its national reach and membership, Hallman’s accomplishments in capital formation, strategic planning, and entrepreneurship will help guide ALBC and rare livestock breed conservation into its next phase of development. “Hallman's extensive scientific background, combined with his keen business sense, seemed like an ideal match for ALBC at this point in its evolution. We know that with Eric's leadership, ALBC will continue to build on the conservation successes that it has achieved over the past 35 years," said Charles Taft, Chair of the ALBC Board of Directors. Most recently, Hallman served as the founder and CEO of the Southeast’s first commercial biostorage company. Under his leadership and direction, the company became recognized as one of the top biorepositories in the United States. In addition to his role as an entrepreneur and founder of several biotech companies, Hallman has served as a university professor and research scientist. He also finds satisfaction in giving back to the community. Hallman has served on a number of non-profit boards, and has been an elected official in the town of Hillsborough, North Carolina, for the past eight years. He holds a Bachelor of Arts in Psychology from Wake Forest University in Winston-Salem, North Carolina, and both Master’s and Doctoral degrees in Neurobiology from Washington University in St. Louis, Missouri. Hallman also completed a post-doctoral fellowship at Duke University Medical Center in Durham, North Carolina. “I am excited about joining ALBC and participating in such an important mission. It’s a great organization with the potential to make an impact on our local communities, as well as in the national dialogue on conservation, biodiversity, and sustainability,” said Hallman. a jazz musician, a local food enthusiast, a frequent organic gardener, and a rookie beekeeper. Hallman officially joined the ALBC staff on April 23, 2012, and will be transitioning with Chuck Bassett, retiring Executive Director, during the coming weeks. The American Livestock Breeds Conservancy is a nonprofit membership organization working to protect over 180 breeds of livestock and poultry from extinction. Included are donkeys, cattle, goats, horses, sheep, pigs, rabbits, chickens, ducks, geese and turkeys. Founded in 1977, ALBC is the pioneer organization in the U.S. working to conserve historic breeds and genetic diversity in livestock. ALBC’s mission is to ensure the future of agriculture through genetic conservation and the promotion of endangered breeds of livestock and poultry. Why are domestic breed of livestock and poultry in danger of extinction? Modern agriculture and food production favors the use of a few highly specialized breeds selected for maximum output in intensively controlled environments. Many traditional breeds do not excel under these conditions, so have lost popularity and are faced with extinction. Like all ecological systems, agriculture depends on genetic diversity to adapt to an ever-changing environment. Genetic diversity in domestic animals is revealed in distinct breeds, each with different characteristics and uses. Traditional, historic breeds retain essential attributes for survival and self-sufficiency – fertility, foraging ability, longevity, maternal instincts, ability to mate naturally, and resistance to disease and parasites. As agriculture changes, we need to be able to draw on this genetic diversity for a broad range of uses and future opportunities. Once lost, genetic diversity is gone forever.